NFA items such as machine guns, suppressors, short barreled rifles, AOWs, Destructive Devices, etc. - All NFA rules apply. 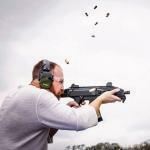 WTS MP5 ciener registered trigger pack $31,495 REDUCED!